Thousands of young, single men had few options during the economic crisis of the 1930s. Many of them criss-crossed the country by train looking for work or a decent meal. By 1932, there were an estimated 70,000 unemployed transients. Many of the men congregated in cities and frustration was growing among their ranks. As the number of jobless transients grew, the federal government feared they could threaten public order. R.B's military chief, General Andy McNaughton, warned that the unemployed could launch a Communist revolt. McNaughton suggested that the men be sent to rural relief camps where they could neither vote nor organize. The camps were voluntary, but those who resisted could be arrested for vagrancy. 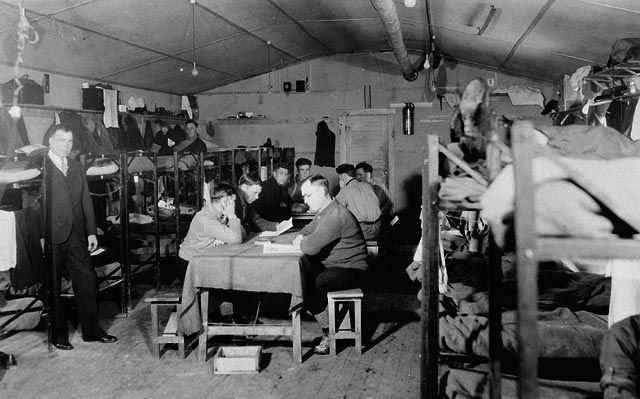 Run by the Department of Defence, the camps were located in remote areas such as northern Ontario and interior B.C. The men cleared bush, built roads, planted trees, erected public buildings in return for room, board, medical care and 20 cents a day for spending money and 1.3 cents a day for cigarettes. The money was never meant to be and was never called wages. While the government hoped the camps would ease the unrest, they became a focal point for the men's anger. The young men were frustrated that the government could not provide them with meaningful work. Militancy increased in the camps. In April 1935, the men's unhappiness boiled over. Fifteen hundred men from the British Columbia relief camps went on strike and congregated in Vancouver. Two months of protests were followed by the decision to take the movement to Ottawa. The action came to be known as the "On-to-Ottawa Trek". The Trekkers were stopped in Regina and after a failed attempt to bring the matter to a peaceful end, the Regina Riot occurred. When it was over, 120 Trekkers and citizens had been arrested. Charles Millar, a plainclothes policeman, had been killed, and Nick Shaack, a Trekker, later died in the hospital from injuries sustained in the riot. In all, 170,248 men had stayed in the camps. The events helped to discredit R.B. 's Conservative government. It also increased the notoriety of the Communist Party of Canada, which was behind the organization of the Trek.